When the boy, Jesus was twelve years old, He followed his parents Joseph and Mary into Jerusalem to celebrate Passover. After the Passover feast is over, they returned home but Jesus stayed behind. Joseph and Mary were traveling along with other relatives and didn’t noticed that Jesus was not traveling with them. After they had traveled a whole day, they realized that Jesus was with them. Joseph and Mary grew panic and they tried to find him among the relatives but He was still missing. When they couldn’t find Jesus, they returned to their home to search for him. 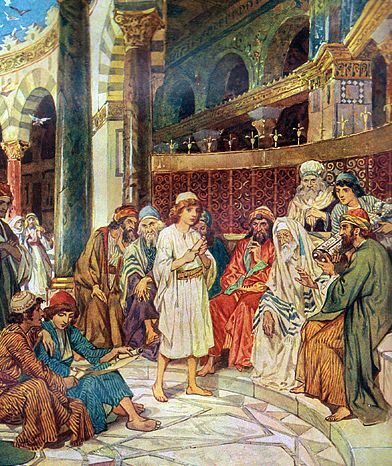 All the while, Jesus was sitting at the temple among the teachers. The boy, Jesus was there listening the questions of the teachers and answering their questions. Everyone who heard Him marveled because of His wisdom. After three days, Joseph and Mary came to the temple to find Jesus and they found Him there. But Joseph and Mary did not understand what the boy Jesus was trying to tell them. After that, the boy, Jesus went back home to Nazareth with his parents. Jesus’ mother, Mary kept everything to herself. The boy Jesus grew in wisdom and favor of men because the spirit of the Lord was with Him.